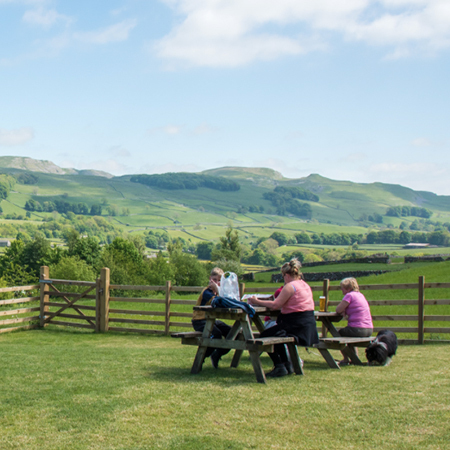 Nestling amongst the rolling Yorkshire Dales Hills is The Knights Table Café and Restaurant. Uniquely situated at the northern end of the Ribble Valley, the Knights table provides food fit for a King. From homemade cakes with a range of specialty teas and coffees through to our fabulous Sunday Roast Lunches using Beef from our own family farm. All our produce is locally sourced wherever possible, ensuring the best cuisine around and all lovingly made fresh by out two chefs who have over 30 years’ experience between them. Serving our fine fare from 9am until 9pm every day, you can be sure of a warm welcome day or night, and depart with full tummies and with a smile on your face. Secure cycle storage is available. The Café and restaurant offers view from both inside and out which are beyond compare, and being full licensed you could always just pop in to relax and watch a stunning sunset while being refreshed with a pint of locally crafted real ale or a glass of wine off our extensive wine list. We can also cater for larger groups who may wish to celebrate a special occasion in style and we can arrange private use of our facilities and separate rooms. If you are outside enjoying the exciting outdoor activities available in The Yorkshire Dales, The Knights Table welcome everyone including walkers, cyclists, runners and dogs (if accompanied by well-behaved owners!!) whatever the weather and the state of your boots or paws. Come soon and sample our wares, you will not be disappointed! The Knights table is located at the entrance to Knight Stainforth Hall Caravan and Camping Park. For over 80 years Little Stainforth has hosted both local and national campers. It is also one of the oldest sites still run by the same family, the Maudsley’s. We are sure you will enjoy your stay at Little Stainforth, and we will do everything we can to ensure that your stay is a pleasant and memorable one. Set in the Yorkshire Dales National Park, the park stands on the 45 acre estate of Knight Stainforth Hall, just 2 mile north of the market town of Settle and nestled on the banks of the River Ribble, a manor house dating back to pre-Norman times, which belonged to the Knight Templar. The park is not only ideally situated for exploring the dales but is also within easy traveling distance of the Lakes and Herriot Country. The Maudsley family a farming family from the Ribble valley for more than six centuries, diversified into tourism in 1927 by accommodating a Scottish Scout group for their summer camp. The park is now run by third generation of Maudsley involved in tourism, Chris and Paul, with help from their wives Linda and Gemma. The site has now moved forward offering high quality facilities in this exquisite locatiion.